This is Peter Moon with O2Compost. Welcome to our webinar series on aerated static pile composting. I am the owner and principal engineer of O2Compost. 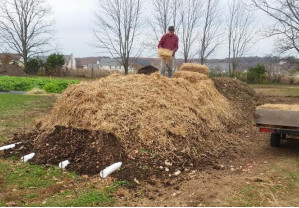 Today’s webinar is the first in a series of 10 intended for commercial scale operators who are currently using a turned windrow method, or for those folks who are interested in starting a new compost business. 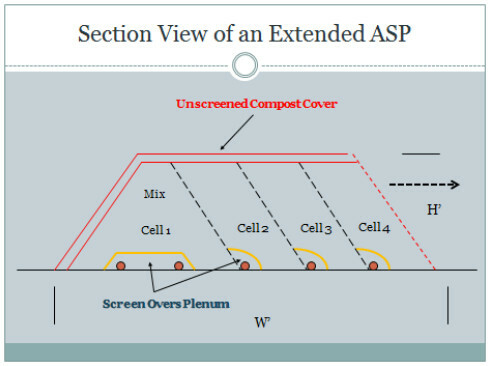 My objective is to describe the ASP method of composting and to compare ASP composting to turned windrow composting, discussing the many advantages. We’re going to focus on each of the ASP benefits. Today is an overview but future webinars will take a look at each of those benefits in detail. The objective of composting is to convert raw materials (e.g. raw feedstocks, food waste from a grocery store) into a high quality soil amendment product that has strong market value. 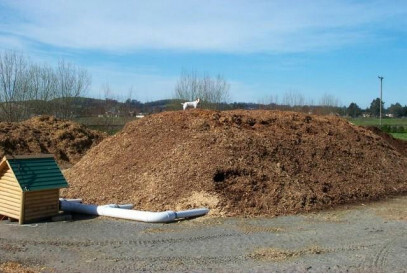 We do this by using the aerated static pile method of composting. The photo you see here is a farm in Petaluma with 40 horses. They were able to develop a system that was extremely sustainable. This project took place about 15 years ago. With aerated static pile composting, we’re constructing a compost pile over a network of aeration pipes and we’re inducing airflow into the pile using an electric blower that is operated by a timer. The timer may be set for 5 minutes every 20 minutes or 2 minutes every half hour depending on a number of factors. The idea is that we’re cycling air into the pile 24 hours a day, 7 days a week. We do not turn the pile during the first 21-30 days, a period we refer to as the active phase of composting. We can adjust the airflow to manage the pile temperatures and optimize the biology of the composting process. Finally, we operate the blower using either grid power or solar power. The next series of pictures will feature different scales of operation. We will start with our smallest scale called a Micro-Bin. 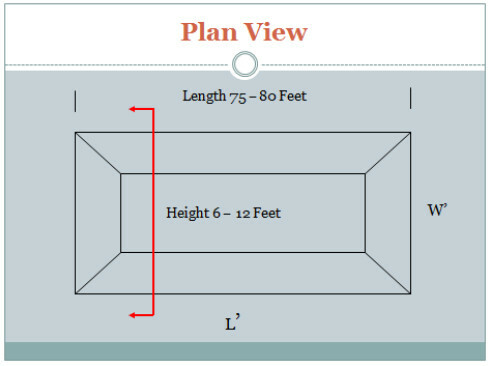 These are 4’ x 4’ x 4’ boxes, 2.5 cubic yards each, and they are excellent for prototyping different mixes. So, let’s say you’re a yard waste compost facility but you’re interested in taking in food waste. This is a great way to test different recipes and different mixes before you go to a full-scale operation. This is a somewhat larger built-in system, not portable like the Micro-Bins. This is a horse farm in North Carolina. Three bins all operated from the same blower with a series of valves to direct the air flow to the bin that we’re currently composting. Similarly, here is a top-down system built in Massachusetts – another horse farm that has been operating for 8-10 years at this point. This is what we call a block bay aerated system. This is a high school in southern California where the students are resident to the school. They each have their own horse and they’re composting manure and food waste out of the cafeteria. This is solar operated system. This is a free-standing aerated pile. It’s a four-pipe project in Pennsylvania and is very similar to a prototype or a pilot-scale project that you might construct at your facility. Working our way up in scale, this is an extended aerated static pile where we have three blower zones; each blower feeding air into a manifold and six lateral pipes. Produce a high-quality compost product in less time and, typically, with higher value. 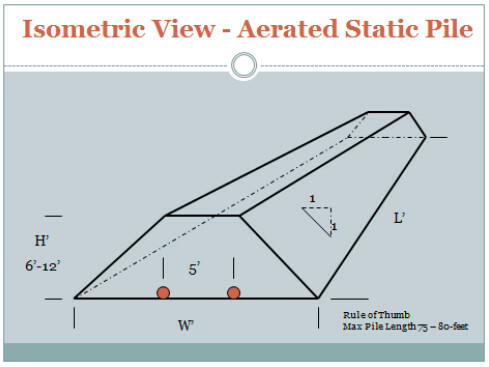 Now let’s look at the geometry of an aerated static pile. 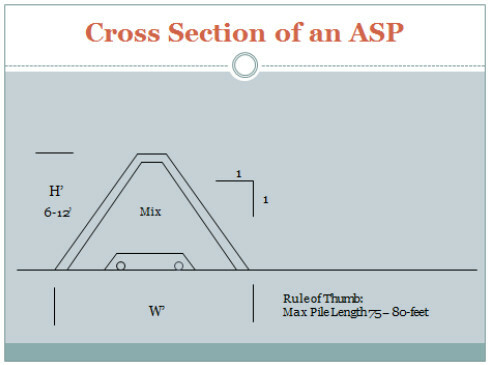 In this example we have the pile width, which can vary greatly. The pile height is typically 6-12 feet. The pipe spacing is about 5 feet. We try to limit the pile length to 75-80 feet to make sure that we’re getting uniform air flow over the full length of that pipe. Generally, we consider the side slopes of a free-standing pile to be about 1:1. Looking down on this same pile, we see the inner rectangle which represents the top of the pile. The outer rectangle is the base of the pile, or the toe where it comes in contact with the ground. In between is our slide slopes. 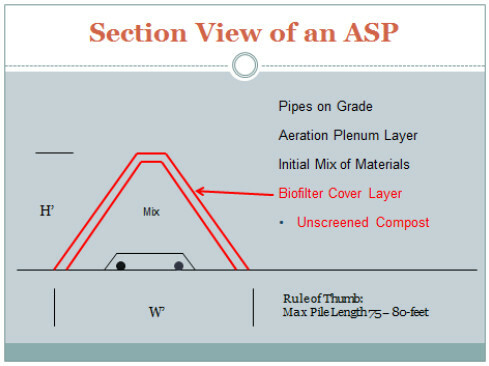 The red line represents a cross sectional view of the pile. Imagine that we’ve taken a slice and moved part of that pile away. There are several component parts beginning with the pipes themselves. For a pilot project, we typically will use thin-wall, perforated and solid pipe – any 4” material that you can get at Home Depot or your local hardware store. When we go to a full scale long-term operation, we recommend a thick wall HDPE pipe. It’s much more durable and it will last for years and years and years. 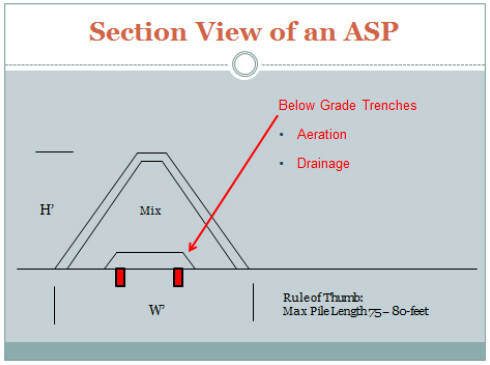 Alternative to pipe-on-grade systems will be trenches built into the concrete slab. There are many advantages to trenches; in particular, not having to handle pipe. However, we need to consider in the design of this system that they need to provide both aeration and drainage should any excess water come out of that mix of materials. These are not maintenance free. They do need to be cleaned out between pile intervals and the trenches themselves need to be cleaned about every six months. 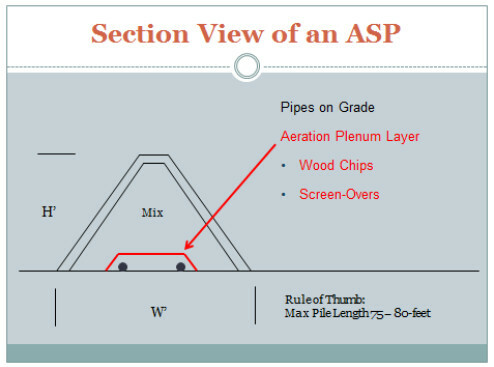 Looking at a pipe-on-grade system, we want to place an aeration plenum layer over the top of those pipes, typically consisting of wood chips or screen overs. This serves as a means of distributing air flow uniformly across the base of the pile. Over the top of the plenum pile, we place our compost mix. We’ll be discussing this in much greater detail in future webinars but, in short, there are three parameters we are looking at. The first is nutrient balance, or what is often thought of as the carbon: nitrogen ratio of the mix. The second is the bulk density of the mix which is an indirect measure of the porosity and our ability to push air up through that pile. The third parameter is moisture content. In my opinion, this is the most critical of the three. We want moisture content of about 60-65% in the initial mix because we are going to be losing moisture during that first 30 days and we want to have sufficient moisture for the composting process to continue without stalling out. Over the top of the mix, we place a biofilter cover layer. Generally, I recommend using un-screened compost. Ultimately, when we break that pile down we’re going to mix that layer in with the other composted material and there’s really no point in screening it and going to the cost and effort of doing that prior to using it as a biofilter cover. 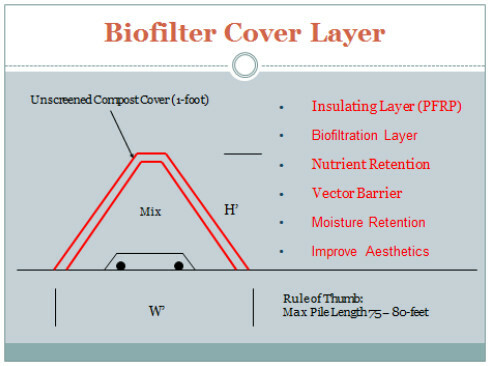 Taking a closer look at the biofilter cover, there are six important reasons for this layer. First, it serves as an insulating layer so that all the materials in that raw mix reach pile temperatures sufficient to destroy parasites, pathogens and weed seeds. General parameters are 131° F for a minimum of three days and this goes all the way to the outer surface of that initial mix of materials. This is referred to as the process to further reduce pathogens, or PFRP. Equally important to that is that the layer serves as odor control for biofiltration. Any of the volatile organic compounds or ammonia or greenhouse gases that are wanting to escape off of that raw mix will get absorbed in that one-foot layer of finished compost and they will get treated in situ by the microorganisms that reside in that layer. The net result is a very mild, fragrant organic odor that comes off of the pile; something that is not strong or offensive to neighbors. The third reason for the layer is nutrient retention. For example, ammonia, which is a nitrogenous gas, gets absorbed in that layer. It’s very efficient. It gets treated and that nitrogen is retained in the finished product which helps that product value. It also serves as a vector barrier for flies, birds, rodents, even larger wildlife. We’ve had instances where bears and coyotes have expressed an interest in what’s in that pile. When they dig into it, they will find very quickly that the sucker’s hot and they won’t go any further. It also helps with moisture retention. I mentioned earlier that moisture management of a compost pile is really critical to maintaining the biologic process throughout that active phase of composting. Ultimately, that outer layer of finished compost helps to improve the aesthetics. There’s a saying in the composting industry … “People smell with their eyes”. If they’re looking at an ugly mess, they will sense that and experience it as an odor. So we want to have a nice, tidy site and this helps tremendously in that regard. This is a picture of a partially constructed pile from one of our hands-on workshops here in Snohomish, Washington. You see the blower and timer, and simple manifold of solid pipe. 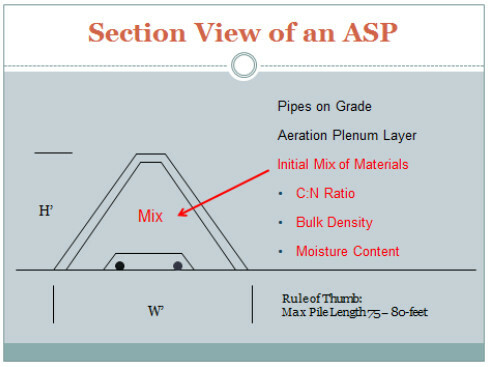 These are lateral pipes. The perforated zone is covered by wood chip plenum material. The green grass and shredded yard waste represents the mix itself. Because we’re in the process of constructing the pile, there is no cover layer at this point in time. Using that same example, this being the aerated static pile, we can add pipe and plenum material and additional mix over the top and progressively make the pile wider and wider. This is referred to as an extended aerated static pile. As we are building the pile, we are also extending the cover because, obviously, our reach is limited by the loader or excavator we are using to apply that material. 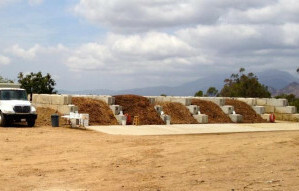 This is an example of a facility in California – a grape pomace compost facility. Each of these piles measure 80 feet in width and about 550 feet in length. They are about 12 feet tall when first constructed and there are 10 blower zones in each pile. Each pile has about 25,000 cubic yards in it. 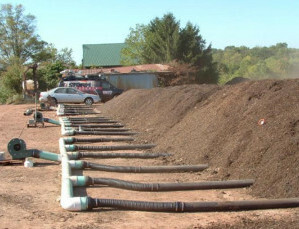 The Benefits of Aerated Static Pile Composting? 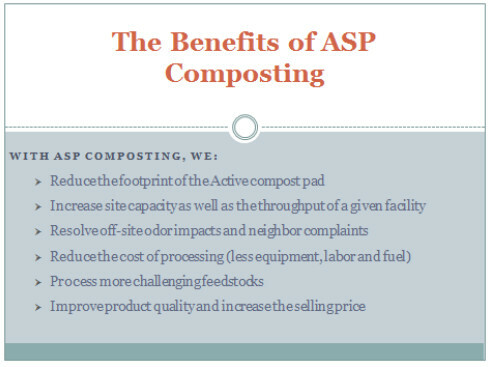 Reduce the cost of processing because we’re using less labor, equipment and fuel during the active phase of composting. We’re also able to process more challenging feedstocks. A lot of the facilities we work with have traditionally been yard waste systems, but now they’re taking in food waste or biosolids or other more challenging and odorous feedstocks and we’re able to manage those odors quite effectively. Finally, we’re able to improve product quality and increase the selling price, ultimately, of the finished compost. How do I get the pipe out from beneath the pile? With the thin wall, it is usually considered to be sacrificial. However, when we try to recover it we can scalp the pile and then do some hand labor to dig it out and pull it out from the pile. Thin wall pipe, because of the heat of the system, will tend to become oval over time and you may get one, two or three uses out of it before it needs to be replaced. For longterm, permanent systems with pipe on grade, we recommend using thick wall HDPE pipe (high density polyethylene pipe). With that, you can literally chain it up to your equipment and pull it out of the pile much like you would pull a cork out of a bottle. What are the pros and cons for using aeration trenches? Certainly, not having to deal with pipe after the fact is a nice thing. However, as I mentioned earlier, they do serve to deliver air into the system and drain water out. So that drainage system needs to be designed and constructed and maintained. That’s not an easy thing to do. What is “positive” vs. “negative” aeration? This is something I haven’t really addressed yet, but positive aeration is when we are pushing air into the pile. I subscribe to positive aeration for a number of reasons I will mention shortly. Negative aeration is when we are pulling air through the pile. With positive aeration, it’s fairly simple. We’re just pushing air up through and we size the equipment to manage the density of the material and the aeration requirements of that pile. With negative aeration, you’re pulling air from the pile and that air stream is going to be extremely hot, whatever the pile is (150-160 degrees perhaps). It’s also going to be saturated with moisture such that when that air stream begins to cool to ambient temperatures, a great deal of water or condensate will fall out of the air stream and end up in the discharge pipe and that needs to be managed. That condensate tends to be odorous and it tends to have an extremely low pH. It’s very acidic so it’s hard on equipment. For that reason, we need to have specialized equipment such as stainless steel or fiberglass reinforced plastic, and it needs to be larger because it’s more difficult to pull air through a pile than it is to push it through a pile. What size blower do you use? This is a great question. I get it all the time. The one answer to this question, and it’s true of most questions in the composting industry, is “it depends”. It depends on a number of factors: the size of the pile, the energy in the pile, the bulk density, and the difficulty of pushing air through the pile. This is something we would help you to determine in the pilot phase of your project. 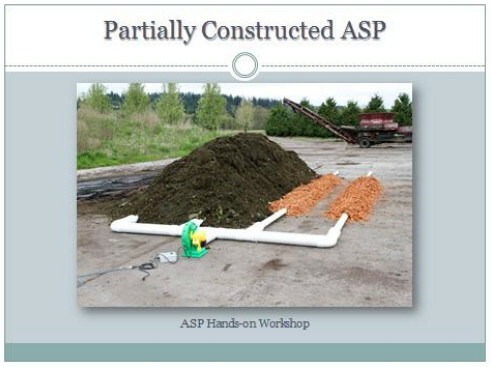 If the ASP Method is so effective, why isn’t everyone already composting this way? This is a good question and, quite honestly, not one that I can answer very easily. 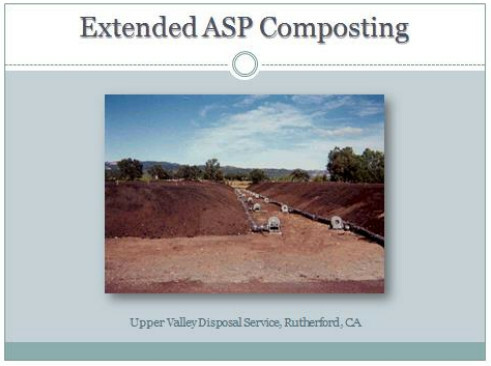 ASP composting was first developed in the early 1970’s in Beltsville, Maryland. It’s in wide use in many facilities but, for some reason, the majority of composting operations still subscribe to the turned windrow method. These are folks we work with quite often for a number of reasons (odors, capacity, etc.) and help them convert over to an ASP system. We will also take a virtual tour of aerated static pile composing systems, many that I have designed and many that are proprietary and scattered around the country. We will look at the secret of aerated composting, which is where we really start talking about the inner workings and the science and engineering of the composting process as well as the keys to aeration and the biology of composting. Ultimately, we will look at aerated static pile composting as a manufacturing process. 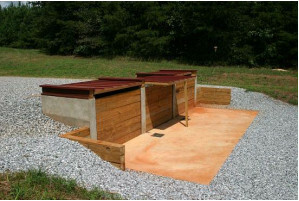 In our training programs, we teach you the art and science of composting. Once you understand the basic principles, the natural extension of that is materials handling and really making the system efficient so that you’re minimalizing the number of times you’re handling the materials. What I recommend is watching any additional webinars that will be posted on our website. 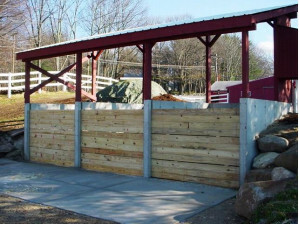 From here you can submit a Contact Us form and we would be happy to schedule a time for a free half-hour consultation with you to discuss your situation and maybe some of the challenges that you’re facing or what you are planning on doing, especially for those who are thinking about starting a new composting business. If you’re interested in pursuing a working relationship, we will send you a proposal for an ASP Pilot Project. After you have had a chance to review that, we will contact you again and you can make a “Go” or “No Go” decision. There is no pressure and no time limit. We are happy to help you whenever you are ready to get started. We are looking for opportunities to help folks like you start up your own ASP system. That completes our first webinar. If you have any questions at this point, please contact us or call 360-568-8085.